More than 500 hikers have been rescued from an Indonesian volcano after being trapped by landslides triggered by a devastating earthquake, an official from the national disaster agency said on Tuesday. 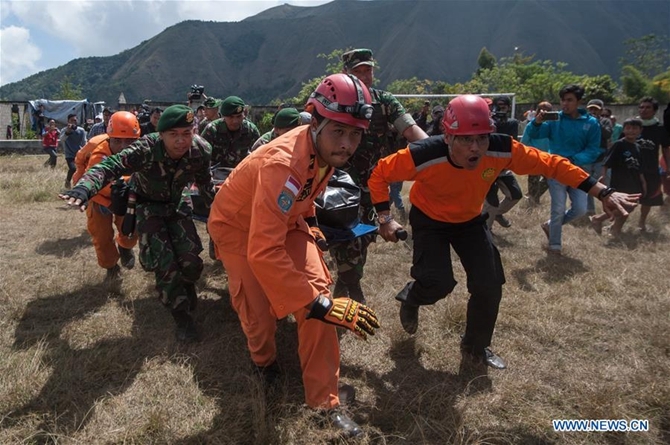 "They are all safe and sound," said Sutopo Purwo Nugroho, spokesperson of the National Disaster Management Agency. A powerful 6.4-magnitude quake struck the country's Lombok island early Sunday, causing landslides on Mount Rinjani volcano, a popular tourist destination that draws hundreds of thousands of climbers every year. The stranded hikers were thought to include citizens from the United States, France, the Netherlands, Thailand, among others. Indonesia is prone to quakes as it lies in vulnerable quake-affected areas called the Pacific Ring of Fire.